Summer camp for adults. Fun and adventure with flair. That's what Forbes.com set out to find, and they came up with five luxury resorts that "pair all the fun of a secluded summer camp with chic cabins and bungalows, top-notch amenities and concierges at your beck and call." Read the Forbes article. The large guest rooms feature Western décor, porch swings and four-poster beds crafted from logs—but also include modern comforts such as Wi-Fi, kitchenettes and hydrotherapy tubs (a far cry from your summer camp days as a kid). You’ll be similarly spoiled when it comes to entertainment; just ask the resort’s adventure concierge to set up your activities at the equestrian center, on the river or in the surrounding canyons. June 8 will be a great day to take a kid fishing: It's Free Fishing Day in Utah. If you've always wanted to learn to fish, June 8th is the day to give it a try. On that day you can fish without a license on any water in Utah. All other regulations will be enforced. If you're looking for a fun activity that's outdoors and close to home, mark June 8 on your calendar. June 8 is Free Fishing Day in Utah. You don't need a fishing license to fish in the state that day. "Make plans now to take your family out and enjoy a free day of fishing," says Drew Cushing, warm water sport fisheries coordinator for the Division of Wildlife Resources. Cushing says early June is one of the best times of the year to fish in Utah. Fishing for warm water fish, including bluegill, catfish, white bass and smallmouth and largemouth bass, is just starting to pick up. And trout and other cold water fish are still active and available to catch. Before Free Fishing Day, the DWR will place extra fish in waters across Utah. Most of the fish will be placed in lakes and reservoirs, so lakes and reservoirs should be good places to fish on June 8. Utah's community fishing ponds are another good place to try. Before June 8, catfish that average 18 inches in length will be stocked into the ponds. "Catch one of these cats," Cushing says, "and you'll be in for a fun fight." Depending on where you live, a community pond might be only a few minutes away. You can learn more about Utah's community fishing ponds at wildlife.utah.gov/cf. Cushing says the DWR will keep stocking catfish into the ponds until the temperature cools in the fall. "Then we'll place trout in the ponds," he says. You don't need a license to fish on June 8, but all of the other rules in the state's fishing guidebook will still be in effect. Cushing encourages you to get a copy of the 2013 Utah Fishing Guidebook and learn the rules. The free guidebook is available at wildlife.utah.gov/guidebooks. Copies are also available at DWR offices and from fishing license agents across Utah. "If you have any questions," he says, "please call the nearest DWR office. We'll be happy to help you out." Many special events will be held at popular Utah fishing waters, including fishing clinics. In some spots fishing tackle will be provided for people who want to learn to fish. See the complete DWR news release for more details. Almost like taking a beautiful tour of the city, this book encapsulates the history, splendor and must-see sites and places of interest in and around Utah's state capital. The list goes on to show 20 attractions. Some are variations of previous listings. For example, above, the LDS Temple and Mormon Tabernacle are both located on Temple Square. No. 20 on this list is "National Parks." The text refers to "Timpanogos National Park" and says: "This national park I had no idea existed before arriving, I sure as anything want everyone to know about it since." The writer is obviously describing Timpanogos Cave National Monument. I found the list to be interesting, it not totally accurate. During the past few years, the Hanksville-Burpee Dinosaur Quarry has proven to be a prolific and exciting location – yielding fossils similar to those found at more famous Utah locations like Dinosaur National Monument and the Cleveland-Lloyd Quarry. Now, members of the public are invited to tour the quarry and interact with paleontologists. 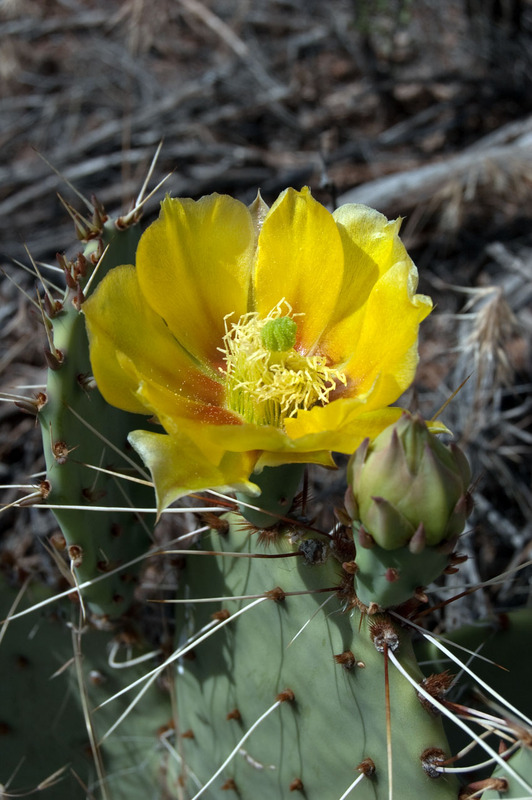 The site is located on land managed by the federal Bureau of Land Management. BLM provided the information below. Hanksville, Utah— This summer marks the sixth season that paleontologists from the Burpee Museum of Rockford, Illinois, are partnering with the Bureau of Land Management (BLM), Henry Mountain Field Station, on the long-term research initiative and interpretive plans to provide educational and recreational opportunities at the Hanksville-Burpee Dinosaur quarry. Paleontologists and education personnel from the Burpee Museum will be on site at the Hanksville-Burpee Dinosaur Quarry to conduct free guided tours for the public. Tours will be available at: 11 a.m., 1 p.m. and 3 p.m., from May 31 through June 9, with the exception of June 2, no tours will be offered that day. Tours will last approximately forty minutes. Groups will be limited to a maximum of 25 people per tour on a first come, first served basis. All visitors are required to sign in at the big tent before starting the tour. Tours will only be offered under favorable weather conditions– if inclement weather conditions occur, tours will be canceled. Notification signs will be posted off of Highway 24 detailing whether the quarry tours are operating each day. Summer temperatures may reach 90° Fahrenheit; visitors are expected to carry at least one quart of water to sustain them during the hour-long trek and should arrive prepared for high temperatures and a hike on undeveloped terrain with appropriate gear. Additionally, there are no developed facilities located at the quarry site. The site is located approximately 10 miles northwest of Hanksville, Utah. The road into the site is not maintained for passenger cars. High clearance vehicles are recommended to access the quarry and four-wheel drive vehicles may be necessary during and/or after storm events. Directions and other information regarding this site can be obtained by contacting the BLM office in Hanksville, Utah, at 380 South 100 West, or by calling Sue Fivecoat at (435) 542-3461. Timpanogos Cave National Monument has officially opened for the season - the visitor center and caves are scheduled to be open through September 22, depending on conditions. Park officials said cave tours were running at capacity all day from Saturday's opening day through Memorial Day. (Sheila) Hunt said the cave's season began roughly two weeks late this year and will end about three weeks early on September 22. The shortened season is a result of federal money cuts, which cut back on the operating budget of the park. Hunt said visitors should plan on calling in advance and reserving tickets. Reservations can be made up to 30 days in advance. "Especially for weekends and any day around a holiday I would plan ahead," she said. "It’s a great day outing, the hike to the caves is beautiful and the caves themselves are just really awesome." Snowbird closed out its ski season today – the final Utah resort to shut down the lifts. Snowbird has this Facebook page that shows photos of recent sking. The resort says it has been a great season. Final seasonal data for Utah ski resorts will be released in a few weeks. 1. National Parks – This is the perfect time to visit our Utah's national parks. Virtually all facilities are open and in good shape. It's warm but not too hot – ideal for hiking, biking and exploring. Easy access points will be crowded but it is easy to find out of the way spots with fewer people. Zion Park is updating this spring Facebook page, with gorgeous photos of wildflowers, animals and scenery. Consider visiting Capitol Reef National Park. It is off the beaten path and so it offers greater chance for solitude. 2. State Parks. A few of our parks are very popular and will be crowded. But many receive only moderate visitation. The video below, showing Starvation State Park, captures some of the fun. 3. Lake Powell is a prime holiday destination. The marinas will be zoos, with lines at the boat launch ramps. But if you cruise away from the marinas you will find almost unlimited sun, sand and sandstone. Fishing is very good at Lake Powell right now. See this excellent report for ideas. 4. Salt Lake City. With many of the locals heading out of town, this is a great time to see the sights in our Capital City. Motels, restaurants, theatres, parks and other attractions will all be open and ready. There will be special Memorial Day services in Salt Lake City and some other communities. Check our regional calendars for details. Be advised, Utah's public transportation systems (buses, rail) will non operate on Monday because of the holiday. More information. Below is the new Starvation State Park video. Make me want to go. Utah's positive lifestyle is well know, and is often attributed to our outstanding recreational opportunities. But there are many reasons people enjoy living and playing in our state. Here's a sample of articles I noticed online today that show some of the perks of the Salt Lake and St. George areas. Salt Lake City—Below-average living costs, above-average pay and a population teeming with twentysomethings make Salt Lake an excellent starting-out city. The overall unemployment rate, at 5% and far below the nation’s average, adds to the area’s appeal. Salt Lake City, Utah - With 10,000-foot peaks within 20 minutes, Salt Lake City may very well be the easiest major American city to get out of, which is why it attracts a large population of outdoor-minded folk. Forbes magazine announced that Salt Lake City ranked No. 3 for “Best Big Cities for Jobs for 2013" with 4 percent employment growth last year. This year, the state’s capital city is ranked No. 16 overall economically. Salt Lake City was named to the list of cities with the most gyms and fitness centers in America. Not bad, for one afternoon. Come see why for yourself. A historic ranch on Antelope Island will be the setting for cowboy poetry and Western music during the 9th Annual Cowboy Legends Cowboy Poetry and Music Festival, which will be held May 24-27, 2013. You are invited to step back through 133 years of Utah history on historic Fielding Garr Ranch on Antelope Island just northwest of Salt Lake City. Then Turn Slight Left at the Fork. to the Entrance to the Ranch. This is a Not for Profit Event in Support of Huntsman Cancer Institute. 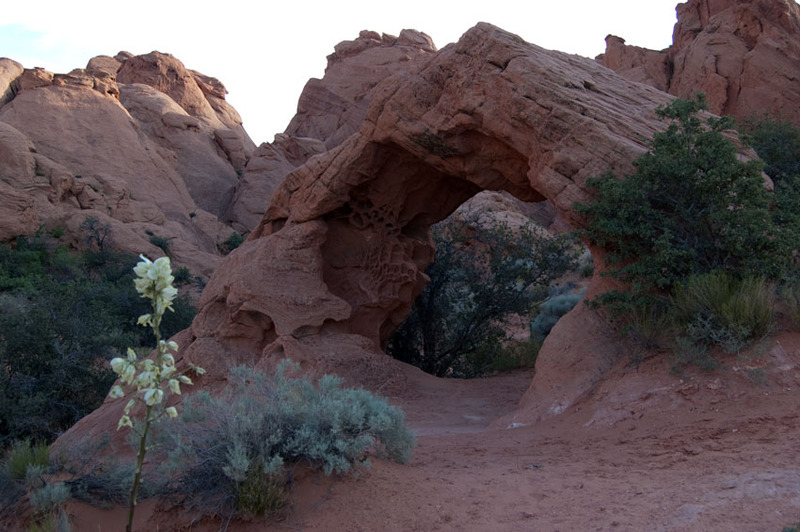 Now's the perfect time to visit the numerous state parks in Utah. And now there is extra incentive. Our parks are sponsoring a scavenger hunt that includes prizes. Grab your camera and a few friends and join us for the statewide Utah State Parks State of Adventure Scavenger Hunt. Beginning Saturday, June 1 register on the Utah State Parks Facebook page and download the list of tasks. Visit as many state parks as you can and complete each of the challenges. As you check off each one, upload your photos to Facebook and be automatically registered to win prizes. The more state parks you see, the more chances to win. Contest ends August 31. Visit www.facebook.com/utahstateparks to enter. Some of Utah's high country roads, that close during winter because of deep snow, are now open and others will open during the next few weeks. 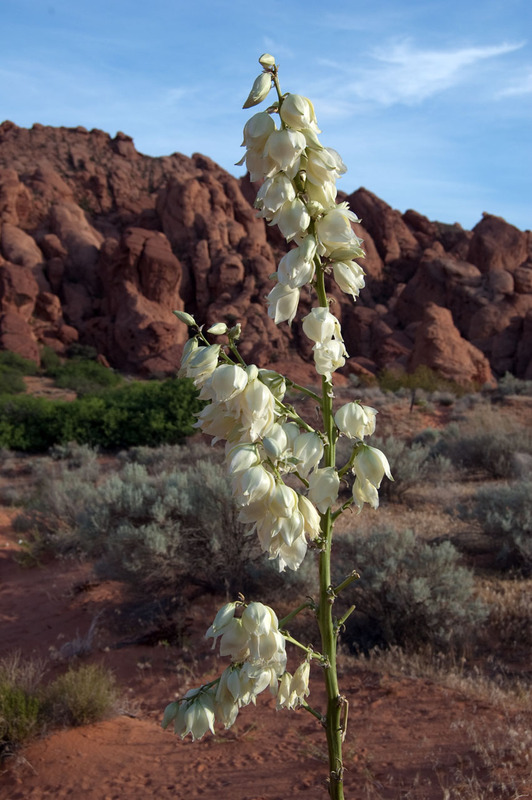 Wildflowers are now in full bloom in low-elevation desert ares in southern Utah. I hiked in the Red Cliffs Desert Reserve and enjoyed seeing a wide variety of flowers, including those shown in my photos here. The Reserve encompasses much of the red rock areas you can see as you drive I-15 south toward St. George. I hiked in the Babylon area, which is southeast of the town of Leeds. We drove the Babylon Road through deep sand to Sand Cove and then wandered around the red rock fins and other formations in the area. It is a fun area, very scenic. We hiked the Arch Trail from Sand Cove down to the Virgin River. The trail passes a photogenic little arch, as you can see from my photo. In nearby Zion National Park, wildflowers are also coming on strong. The next few weeks will bring the peak of the flower season. The park has this page about viewing wildflowers. The wildflower season starts later at higher elevations. Cedar Breaks National Monument, located in the tops of the mountains east of Cedar City, is one of the great places in this region to view wildflowers. There the season usually peaks in mid-July. Cedar Breaks sponsors a Wildflower Festival that begins on July 6 and continue through July 21, 2013. In northern Utah mountain areas the blooms peak in mid or late July. Popular viewing areas near Salt Lake can be found at the top of the Cottonwood Canyons (where some of our famous ski resorts are located). The Alpine Loop, which circles around the east side of Mt. Timpanogos, is also a famous area for flowers. Here's a gig that would be quite enjoyable: Artist-in-Residence at Zion National Park. Zion National Park will begin accepting applications for the 2014 Artist-in-Residence program on May 26, 2013. Applications must be postmarked by July 19, 2013 and received by July 24, 2013.Four artists will be selected for two spring and two fall residency slots. Artist selections will be made and announced in October. All visual (painters, photographers, sculptures, etc. ), performing (drama, dance, music, composers, etc.) and literary artists are welcome to apply. The Zion National Park Artist-in-Residence program offers professional artists the opportunity to live and work in the majestic desert environment of southern Utah for a period of one month. This call for artists applies to four sessions: February 3-March 4, 2014, April 1-30, 2014, September 1-30, 2014, and October 16-November 14, 2014. The works completed under this program will contribute to the public understanding and appreciation of Zion National Park and should reflect the National Park Service's mission to preserve and protect the park's cultural and natural resources. During the Residency period the artist will be expected to present two public programs, tailored to the individual's medium, interest, and experience. One will take place at Zion National Park and the other at Southern Utah University as part of their Art Insights program. Zion National Park will work in conjunction with faculty and staff at Southern Utah University in Cedar City, UT to select artists who will work in Zion for the four-week residency period. Selected artists will be given a rent-free, furnished house inside the park. For complete details about this program and to download application materials, visit www.NPS.gov/Zion. For more information contact: 435-772-0184 or email zion_artist_in_residence@nps.gov. GolfWeek.com is out with a couple "best of" lists and I was pleasantly surprised to see four Utah courses made the rankings. Three Utah golf courses are included on the 50 Best Municipal Courses list and one of our courses is included on the Best Resort Courses list, as shown below. I've heard wonderful things about the Hideout course, but I've never played there. Glad to see it on the list. What do you think? What Utah courses would you put on these lists? "There is something mystical about the feeling that envelops a visitor who enters goblin country on foot. These fantastical formations — some crowded together and others separated by several feet — rise slightly above the heads of most adults. Then there are the short formations that instantly remind you of goblin children. Although they have been taking shape for millions of years, there is no sense of the great antiquity that you experience among the ancient bristlecone pines of the White Mountains or the deep rock walls of the Grand Canyon. Instead, there is a sense of something both old and young and, indeed, mischievous. These are not formations among which you tiptoe but, instead, you explore with delight. "If goblins were not enough, the outskirts of Goblin Valley boast wonderful slot canyons for hiking and exploring... We were especially delighted with Little Wild Horse Canyon, which offers a variety of polished rock surfaces, stunning views and rich color offset by blue sky. The entire loop takes about half a day to complete, depending on your pace. Little Wild Horse Canyon by itself can be done in a little more than an hour, not counting the many stops for taking photos." I've included one of my Goblin Valley photos here, to show the flavor of the area. Utah's Division of Wildlife Resources, State Parks and other agencies are cooperating with Cabelas, which is sponsoring a fishing derby with a $1,000,000 grand prize, plus numerous other prizes. Several Utah waters now have tagged fish swimming around. If you register for the contest and then catch a tagged fish, you could be a big winner. I normally avoid contests and promotions like this. But, since I'll be out fishing anyway, I decided there is no down side to registering and participating. There is no fee to enter or participate. Join me fishing -- it's great fun. If you happen to catch a tagged fish and win a prize, that's a bonus. See the contest website for details and official rules. Working with fish and game professionals, 1,500 fish have been tagged and by released into eligible waters. The contest period ends July 7, 2013 at 11:59 p.m. To win you must register and then catch a tagged fish between now and the end date. Here's a quote from the article: "One jump site sits at the top of the 900-foot-tall Mineral Canyon Cliffs on the appropriately named Green River while the other, the aformentioned Parriott Mesa, stands in Castle Valley like a forbidding fortress. The hike to the launch zone is strenuous, but you don't have to worry about walking back down." The magazine also has this new article, Hike Solo in Utah's Canyon Country, which describes a backpack through Coyote Gulch in Grand Staircase-Escalante National Monument. One more quote: "On the second day, I spend a little time bouldering in the canyon on blocks of sandstone that long ago calved from the walls. I hike the two miles over to the Escalante River, and go wading in its fast-moving current. But mostly I souse around in the waterfalls, enjoying myself in deep, swirling swim holes, and do nothing." The East Entrance to Yellowstone National Park opened today as scheduled. The South Entrance will open on Friday, May 10, weather conditions permitting. Budget cuts had prompted the park service to delay plowing roads, and that threatened to keep the park closed, but local communities and businesses pitched in to push snow off access roads. The East Entrance to Yellowstone National Park will open for the season on Friday morning, May 3, as originally scheduled. As of 8:00 a.m. Friday, visitors will be able to travel through the park's East, West, and North Entrances to many popular park destinations including Old Faithful, the Grand Canyon of the Yellowstone, Norris Geyser Basin, and Fishing Bridge. The road from the park's North Entrance at Gardiner, Montana through Mammoth Hot Springs, and on to the Northeast Entrance and the communities of Cooke City and Silver Gate, Montana, is open all year. Budget cuts due to the impacts of sequestration prompted the park to take many administrative actions and make changes to park operations for this season. This included delaying the start of plowing which pushed back the scheduled opening of roads by one to two weeks. However, the park's East and South Entrances are now set to open as originally scheduled thanks to the support of the communities of Cody and Jackson, Wyoming, who provided funding which allowed Wyoming Department of Transportation crews and equipment to join the National Park Service in clearing snow from some park road segments. Travel through the South Entrance to Grant Village, West Thumb Junction and on to Fishing Bridge and across Craig Pass to Old Faithful is set to open as originally scheduled on Friday, May 10, given favorable weather conditions. Visitor services throughout the park are opening for the season. Operating dates and hours are available online at http://www.nps.gov/yell/planyourvisit/ocd_locale.htm or by consulting the free park newspaper, provided to visitors at each entrance station. Visitors should be aware that spring in Yellowstone is very unpredictable and often brings cold temperatures, high winds and falling snow. Even cleared sections of roads can be narrow and covered with a layer of snow, ice and debris. Therefore, visitors should use extreme caution when driving as road clearing operations can be ongoing at any time throughout the park. In the case of extreme weather conditions, temporary road closures are also possible with little or no advance warning. Updated Yellowstone National Park road information is available 24 hours a day by calling 307-344-2117. Information on current conditions in the park is also available online at http://www.nps.gov/yell/conditions.htm.